One of the more competitive districts in Class 6A includes traditional playoff contenders Dodge City, Garden City, Hutchinson, and Wichita Northwest. Dodge City visits Wichita Northwest for a key match-up to open District 8. Dodge City has played as many games against Wichita City League opponents as they have in their Western Athletic Conference. The Red Demons opened the season with consecutive wins over Wichita West (27-18) and Wichita Southeast (42-0) before falling late to Wichita Heights (26-21). After wins over Liberal and Great Bend, the Red Demons lost a 64-50 shootout at Hays a week ago. Dodge city is led by junior quarterback Caden Walters. Walters (6-1, 195) has passed for 1,856 yards and 14 touchdowns and rushed for 275 yards and ten more scores. Last week against Hays, Walters passed for 453 yards and four touchdowns and added 29 yards and three scores on the ground. Juniors Dayton McGroarty, Mark Adams, Eric Ried, Bryce Unruh, and Tyler Trent are all capable recievers. McGroarty leads the team with 526 receiving yards and two scores. Adams has 407 yards and a team-high four scores. Ried (397), Unruh (286), and Trent (259) all have been steady targets. The Red Demon offense averages nearly 37 points per game, while surrendering 25. Wichita Northwest has won five consecutive games since a 43-14 loss to Bishop Carroll to open the season. The Grizzlies have surrendered only 20 total points in their past four games. Running back Keshaun McGaugh (6-0, 175) has had a breakout season after transferring from Wichita Southeast. McGaugh has rushed for 822 yards and 12 touchdowns through six games. Quarterback Kevin Folsom was effective at leading the Grizzly offense. The junior passed for 709 yards and eight touchdowns and rushed for 385 yards and six scores through five games. Unfortunately for Northwest, Folsom suffered a broken ankle in a Week 5 win over Wichita West. Sophomore K’Veion Richard got his first start in last week’s 49-6 win over Wichita South. Richard passed for 104 yards and a score and added 57 yards and a score on the ground. Richard will need a similar performance this week in what could be a high-scoring game against Dodge City. These teams have met in each of the past four years with Dodge City winning three of those meetings. This Centennial League showdown may have lost a bit of its luster last week, but certainly not its importance. Topeka High will travel to Manhattan for a leg up in a tough district that also includes Lawrence Free State and Washburn Rural. The game will also be key in deciding the Centennial League race as Manhattan goes for at least a share of the title for a sixth consecutive season. A week ago, Topeka High was unbeaten and ranked third in Class 6A. The Trojans built a 14-0 lead in the first half, but Shawnee Heights’ Tony Barksdale Jr exploded for three touchdowns to give the T-Birds the lead. Topeka quarterback Alec Beatty responded with a 55-yard touchdown pass to Dante Brooks to tie the score at 21. Eventually the Trojans could not answer a Shawnee Heights touchdown in overtime, resulting in a 28-21 loss. Beatty keys the Topeka High offense and is one of the state’s most dynamic players. But he has plenty of weapons around him including Mike McCoy and receivers like Brooks and Khalil Austin. Meanwhile, Manhattan knocked off rival Junction City 16-7 last week to take back the Silver Trophy. The Indians remain unbeaten, but have survived tests over those same Shawnee Heights T-Birds (28-25) and Topeka Hayden (23-20). Running back Chris Martin scored with less than ten seconds remaining to top Shawnee Heights, while kicker Joe Trujillo hit a 28-yard field goal with two seconds remaining to beat Hayden. Quarterback Erik Prockish directs the Indian offense, but Martin has taken some direct snaps on occasion. The Manhattan defense allows only 12 points per game. The Indians have beaten Topeka High in each of the past six seasons with three games coming by a touchdown, and the other three games coming by two touchdowns. Carroll is easily the best team in Class 5A through six weeks and has outscored opponents 325-44 with the classification’s No. 10 strength of schedule. The Golden Eagles rank No. 1 in scoring offense and scoring defense inthe class. Carroll and Pittsburg remain the lone unbeaten teams in Class 5A. This marks the first meeting between Carroll and Maize in the last 10 years. Denzel Goolsby, a Kansas State commit, continued his fine season with 16 carries for 134 yards last Friday. Carrroll defeated Southeast 58-8 for its third straight City League championship. The Eagle defense limited Wichita Southeast for 0 of 10 on third down. Quarterback Colton Howell played just over one quarter and rushed for two scores, passed for one and also caught a 38-yard score. Maize pulled off a wild 42-41 overtime victory against Newton last Friday when quarterback Connor Lungwitz threw a touchdown pass on 4th-and-25 to Kendall Stewart. Alan Sanchez kicked the extra point for the victory. Lungwitz finished with 430 passing yards and five scores against no interceptions in the victory. Stewart finished with nine catches for 170 yards, and Gabe Chavez had 10 catches for 160 yards. Maize has the ability to score points (229 this season), but its defense (190 allowed) is lacking against an elite Carroll team. Lungwitz makes some plays, but it’s not enough. Class 4A, Division I District 8is one of Kansas’ best with undefeateds Hays and Abilene, along with Buhler (5-1) and McPherson (4-2). Hays High captured the Western Athletic Conference title last week with a 64-50 home victory against Dodge City. Buhler ranks No. 1 in scoring offense with 267 points and Hays stands second at 266 – with the No. 2 strength of schedule. Buhler, the defending Class 4A state champions, hasn’t lost since a 41-20 defeat at Andale in Week 1. Buhler has won five consecutive contests by at least 28 points. Hays High has already matched last year’s win total under first-year coach Bo Black. The Indians have received great performances from several players this season. Senior quarterback Alex Delton has rushed for 1,019 yards and 12 scores, easily the best in the WAC. Delton has passed for 845 yards with seven scores against just one interception. Hayden Kreutzer has put together a strong year with 22 catches for 503 yards and five scores – and has recovered three fumbles on defense. Connor Rule leads the Indians with 53 tackles. Buhler rolled over El Dorado 60-7 last week. Standout quarterback Jace Williams threw a pair of touchdown passes, and Dillon Engelland rushed for five scores of 3, 32, 1, 12 and 58 yards. Longtime coach Steve Warner has gone over 200 career victories this season. Delton, though, is playing at a level few quarterbacks reach and leads Hays to the win. The Class 2-1A, District 4 championship is on the line as No. 3 Olpe travels to No. 5 Lyndon. These teams have competed in the same district in each of the past four season. Lyndon has won the previous three meetings, including a 27-25 nail-biter last season. Coach Chris Schmidt’s Olpe Eagles have won five straight after a 28-8 Week 1 loss to then top-ranked La Crosse. The Eagles are led by a solid offensive line and talented quarterback in Bo Krueger. Krueger passed for 115 yards and two scores and rushed for another touchdown in last week’s 47-0 win over Oswego. Dylan Redeker, Wyatt Redeker, and Brady Scheidgger are solid receivers that can really compliment Krueger and running back Andrew Burenheide. The Eagles defense has also been strong in only allowing10 points per game since that Week 1 loss. Lyndon has a new coach in 2014, but the Tigers are still off to an unbeaten start. Brent Hoelting took over the Tiger program when Rod Stallbaumer left to coach Basehor-Linwood. Hoelting’s Tigers have only been tested in a 36-30 win over Mission Valley in Week 2. 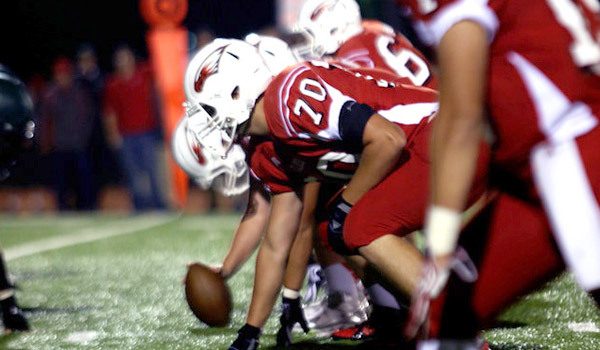 Senior Dawson Swinehart leads the Tiger offense that keeps the ball on the ground. Lyndon is averaging more than 330 rushing yards per game this season. Swinehart has rushed for a team-high 903 yards and 15 touchdowns, while Daniel Burgess has added 682 yards and 11 scores. On defense, junior Fitch Wyatt leads the Tigers with 64 tackles through six games. Senior Gabe Lueszler has registered 48 tackles and 10.5 sacks this season. The Eagles have played quality competition in La Crosse and Riley County to open the season. Those tests prepare them for a close win in this one. Marion will make the 229-mile drive to Meade in a matchup of two of the stronger Class 2-1A teams for a non-district game. Both teams have reloaded with virtually entirely new personnel this season. Marion returned three starters on offense and just one on defense from a 9-2 Class 3A squad, while Meade had just one offensive starter and two defensive starters back from a 10-2 team. Meade and Lyndon remain the only two unbeatens in a topsy-turvy classification that has no clear favorite. Meade’s strength of schedule was in question at the start of the season and is ranks No. 40 out of 40 teams in the classification according to preppowerindex.com, but the Buffs do own a pair of quality wins. The Buffs have defeated Lakin (36-16) and Cimarron (12-6), both Class 3A teams with 4-2 records. As usual, Meade has put up big rushing numbers behind its single wing attack. The Buffs have rushed for 309 yards a game and passed for just 60. Four rushers have between 334 and 413 rushing yards. The Buffs have outscored opponents 248-71, and rank No. 2 in scoring offense and No. 2 in scoring defense in the classification. Marion is 2-2 at home and 2-0 on the road this season after it has played very well at home the last couple of years. The Warriors, long known for defense, have outscored opponents 180-93 and rank No. 8 in scoring defense with the No. 20 SOS. Marion lost 30-6 to surprisingly undefeated Hutchinson Trinity in Week 2 and 22-12 to a quality Ell-Saline squad in Week 4. In the last 10 years, Meade is 45-0 in district play and 32-20 in non-district games, according to Maxpreps, but the Buffs find a way to grind out the victory.